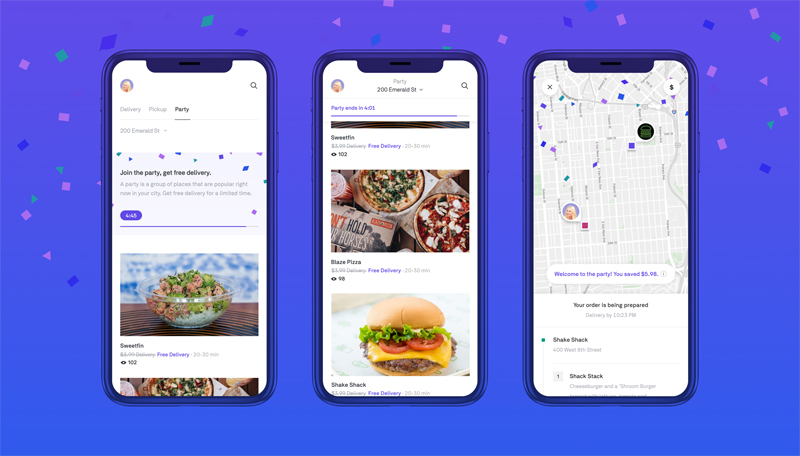 Combining proximity-based aspects of Tinder and Nextdoor with food delivery, Postmates’ new “Party” feature gives customers the ability to save money ordering from popular restaurants by showing a list of places people in in your neighborhood are currently ordering from. By joining the party, Postmates users can share delivery from certain restaurants and get free delivery. The Party feature was launched last week in Los Angeles, New York City, San Francisco, Miami, Chicago, Seattle, Las Vegas, Long Beach, Phoenix, San Diego, Orange County and Philadelphia. Each so-called party has a five-minute time limit in which the customer must place their order to get the deal. Joining this subdivision soiree is easy — open the app and click on the Postmates Party tab. Trending nearby merchants are shown and customers who place an order before the time runs out get a free delivery on their order. As somebody who strives to be a good neighbor, there’s a fine line between keeping up friendly acquaintances and knowing far too much about the folks next door. Put me down in the camp of those who don’t want to know the sexual proclivities, current culinary desires or grievances swirling inside the mind of one’s neighbors. Or, perhaps, I just don’t want my neighbors knowing this is my third order of wings in the last week.